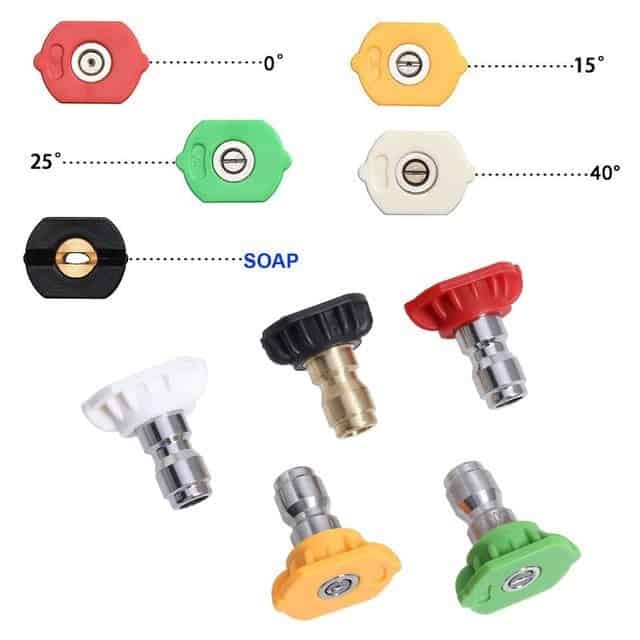 Today I am going to clear the confusion about pressure washer nozzles that you have in your mind right now. 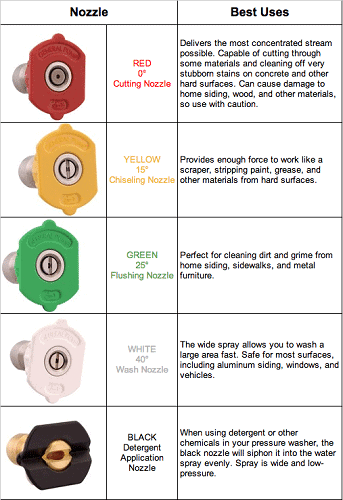 You will also learn about the nozzles color code. Peeling the paint off your favorite car! Choose the right nozzle and you are ready for a perfect wash. The GMP or PSI will not be a problem with a perfect nozzle. Here are My Top Nozzles. But, Massive Discussion is Right Below. So, wondering how does that small thing create such a force? Let me explain. I was in that condition too earlier. You might be thinking there is a high-pressure motor for water pressure, then what? Remember when you used to water your garden with a hosepipe? And you needed to water something that is 15 feet away but could not reach it. You pressed the head of the pipe blocking ¾ of the opening. And boom! The water is increasing with high pressure and covering the distance. The same theory applies here, the nozzle’s orifice. More velocity means more distance. The pressure is constant though. When I was in engineering school I read about this orifice issue. Simple issue, make the outlet of water smaller so that the water exit with high velocity, according to the Law of Motion by the great Mr. Isaac Newton. The 0⁰ nozzle. It shoots a jet of water in a straight line. When it reaches the surface it covers a very small area, similar to the size of a soda bottle! I get bored with this nozzle. So tiny coverage! Even it does not fan out the water. Point and shoot job! Then the 15⁰ nozzle. It creates a 15⁰ water jet spray at the nozzle. Definitely a larger area coverage and as we learned earlier larger area means less velocity so as the water pressure. Now the 25⁰ nozzle which comes with an even larger sheet or a fan of water than the 15⁰ nozzle. And larger coverage area means less pressure on the surface. The 40⁰ nozzles come with more coverage area than 25⁰ nozzles resulting in lower pressure on the surface making it a gentle spray. I rarely use this. Neither in the factory, I work nor at my house! It covers so little spray area that it can take so much time to clean something. It can sometimes be very unsafe as it has a great amount of pressure on that spray area. You can use it to clean areas that are high and hard to reach. Good for cleaning crevices or sidewalks. This nozzle is very good for the targeted area where you have a stubborn stain, rust, thick layer of mud. We use this nozzle on my work in the paint industry where sometimes the paint gets caked with the storage vessel. I hope you know the pain of it. Probably this is the most popular and widely used nozzle tip for home use. I use this spray tips on painted surfaces, siding, fences and on these outdoor power tools like lawn mowers. The pressure and coverage area is so great that it became so versatile for use. You probably can understand now that the higher angle makes the pressure soft on the surface. This nozzle is used for window or glass cleaning widely. Thinking about using water and detergent at the same time? This nozzle is the choice for you. The larger angle combining with larger orifice generates enough pressure to pull detergent with water. It will make your cleaning a lot easier. It makes the water jet to rotate by the combination of 0⁰ blasts and the spray area of 25⁰ nozzles. It creates a round cone shape when it reaches the surface. A complete pack of nozzle just in a single nozzle! Rotate it to change the blast angle depending on the job you are performing. It can be difficult while selecting the perfect nozzle for a specific job. Yes, I faced the same problem too. But now I am going to make it easy for you with some simple considerations. 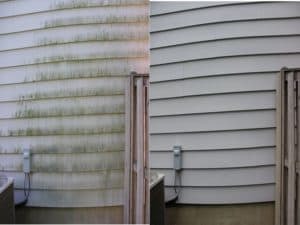 If you are new with a pressure washer you will feel the thrill! It’s like accelerating a motorbike. More gas more power! But wait, don’t let the fun damage your stuff. Maintain a distance at first. You will understand how the distance and pressure are working together. Usually doubling the distance will halve the pressure. So use your common sense at first. Start with a wider angle nozzle. Change your distance till getting the perfect wash without damaging the stuff. Try to follow the sizing chart. If you can’t be satisfied with your washing only then change to a more intense nozzle. This will give you more pressure to complete the job. But always start testing on a small area. And remember to play with your distance to maintain the desired pressure. That’s the first thing you can do. It’s always better washing without damaging! How Can You Take Care of Nozzle? Do you have a pin? You should. Use it every time before you start using the nozzle. This will keep the head clean from any clogging at the tip. Nozzles are prone to blockage, so keep them clean. 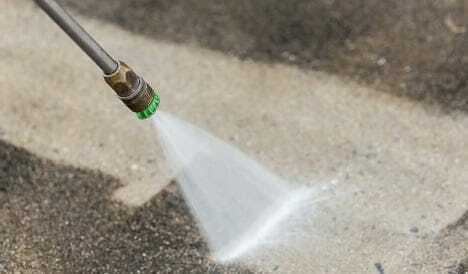 However, you can witness your pressure washer nozzle leaking water. This is a rare case. Proper cleaning can prevent this type of issues. But, if you have a damaged seal you must order a new o-ring gasket. Some user face difficulties with nozzle selection. If you have gone through this guide you are not going to be one of them. The first couple of times are difficult. You are going to end up with wrong ones. But proper knowledge on this is going to save you. Where did I Collect This Information From? Definitely from me and my friend’s user experience. These topics are just a gist of our years of experience. And then there is Wikipedia! 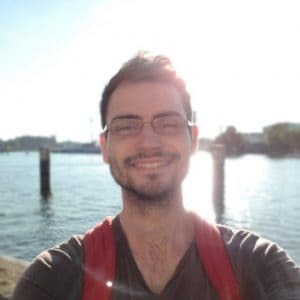 And if you want to know more about the working of a pressure washer Atlantic Pressure Washer resource page can be of your help. We have covered most of these in our blog section though.